Yorkshire-based residential developer Fraser Morgan has received planning consent for a £26m student living development in Sheffield city centre. The 289-unit scheme of five to seven stories will be built in Allen Street on a site currently occupied by former industrial buildings. The development is in the St Vincent’s Quarter of the city centre within walking distance of University of Sheffield and Sheffield Hallam University campuses. Designed by David Cox Architects, the scheme embraces the acute angles of the triangular-shaped site to feature an iconic curved façade on the corner of Allen Street and Shepherd Street. Mark Robinson, managing director of Fraser Morgan, said: “We’re very proud of the design for this scheme which gained overwhelmingly positive feedback by members of the planning committee. “These spacious studio apartments will offer something different to the typical mix of flats and houses that make up the student living market in Sheffield. David Cox, director of David Cox Architects, said: “Due to the geometry and topography of the city we created a dramatic architectural design with acute angles to compliment the environment. Warden Construction has been appointed as main contractor on the development. It aims to have the development under construction in February 2019 and completed by August 2020. Fraser Morgan, based in Huddersfield, has developed a specialism in luxury student living developments aimed at promoting healthy lifestyles and wellbeing. Its developments focus on aiding mental and physical wellbeing through inspiring communal areas, exercise and relaxation spaces, and homely living spaces. Spacious rooms offer kitchen and dining facilities, a double bed and large study area with large windows to optimise natural light. 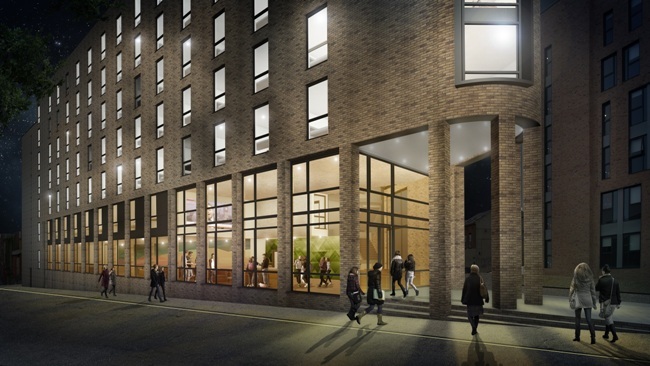 The company recently completed a £15m student living development in Preston City Centre named Canterbury Hall to cater for students attending University of Central Lancashire.